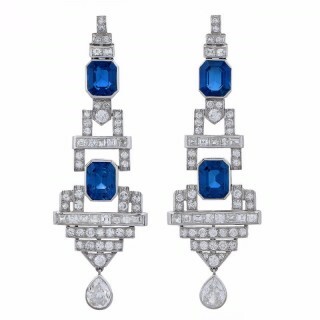 A pair of Art Deco sapphire and diamond ear pendants, of geometric design, each tapered to accentuate two rectangular cut-cornered sapphires, which are elegantly spaced within an articulated single- and square-cut diamond surround, suspending a pear-shaped diamond drop, all mounted in platinum. Measuring 6.5cm in length. Circa 1930.